Next week I will be holding a seminar for the Potter League for Animals in Middletown, RI. It is a great shelter run by some great people. The seminar I’ll be doing is on reactive dogs, dogs that blow a gasket when another dog or person comes around. This has become a huge problem and I believe there are two reasons for this. The first reason is that choke and prong collars are too popular in group dog training classes. If this type of collar is used in training it should always be used in a very non-distracting environment – no dogs or people around because the dog could associate the stimulus of the collar with the other person or dog. A dog in a room full of other dogs being yanked on a choke or prong can and often does result in aggressive behavior towards other dogs. The other reason for reactive behavior is UN-intentional reinforcement from the owner. The dog becomes excited and the owner tries to calm the dog by petting and maybe giving treats. Here is an interesting fact about helping the reactive dog. Most of the prevailing wisdom will advise to use “counter-conditioning” to help the dog. Counter-conditioning is when you pair something good (food) at the sight of another dog. The other recommendation is to use an electronic or prong collar. This could be like putting gas on a fire. Yanking on the dog trying to suppress the behavior can and will make some dogs go out of their mind aggressive. I’ve seen people work for months with their dogs from a distance, rewarding the dog for being “under threshold.” Then they get within 20 feet of another dog and it’s back to square one. The dog loses it. The owner patiently goes back to the other end of the football field and starts rewarding the dog again for not reacting. I’ve seen dog owners do this for months and when they are ready to give up, they are often blamed for not trying hard enough. The trick to making counter-conditioning work is to use an interrupter. 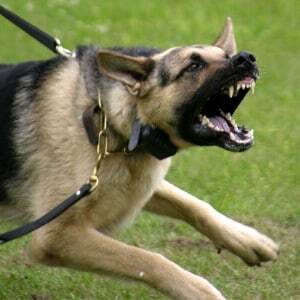 As you approach another dog and the dog becomes reactive you have to “Interrupt” the dog’s behavior. The second you interrupt the dog’s reaction it will give you an opportunity to reward a different response from the dog. Usually after a session or two you can walk the reactive dog right up to the other dog. Sometimes you can even let the dog to the end of the leash and sniff the other dog. I know to some of you this may sound outrageous, that I am exaggerating, which is why I record what I do, so you can see up close real world results. BTW – if you have a reactive dog right now you can get help. The Dog Training Inner Circle is the place to go and you can get started for just $1.00! Where else are you going to find dog training help for that price?